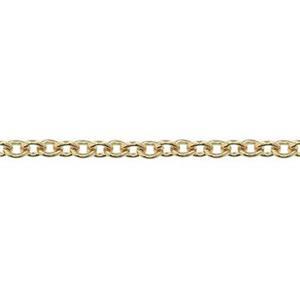 This bright yellow gold-filled bulk jewelry chain has thicker links so it is considered a heavy cable even though the chain is a narrow diameter. Unfinished jewelry chain is perfect for making layered pieces and is easy to finish using a variety of basic necklace making supplies. Made in the USA. The inner diameter of the chain link is too small for the traditional placement of jump rings. Even 24 gauge wire will be too large. You will need to finish these chains with crimp endcaps.